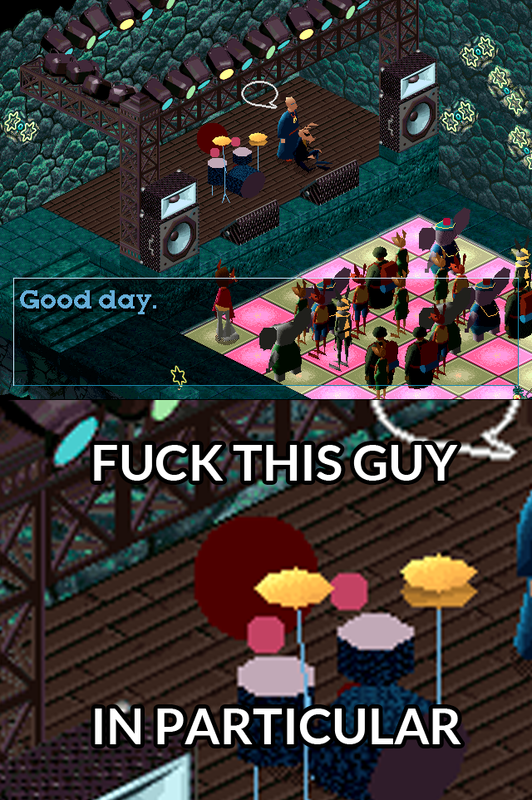 That or the design team just hated drummers. Maybe all the drums attached to the model limit the number of polygons ? On reddit a guy said that there was too many people in the room already and it stuttered on some machines. So he was dummed down to keep polygons the lowest possible. A lot of the others in the room arnt animated, just sprites I think. Not even sprites, solid objects ! You loose life when running into them. And the room still is laggy on my DS. Hah, you're right. I remember thinking how bogus that was as a kid, and they fact they didn't move.